An interesting texture turns this simple shape into a sophisticated top. It’s simply constructed of two identical rectangles, with the front rectangle split at the neckline. Fasten the top button, and the neckline mirrors the shape of the drop-stitch lace motifs. 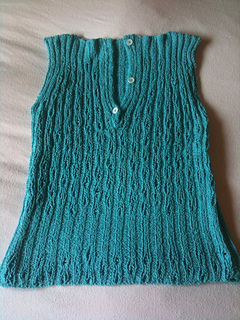 Knit from Cascade Pima Tencel, this tank provides comfort and stretch. This top is very stretchy. Choose a size at least 6” (15cm) smaller than your actual bust measurement.